All our products have such a paper tag.What is this? 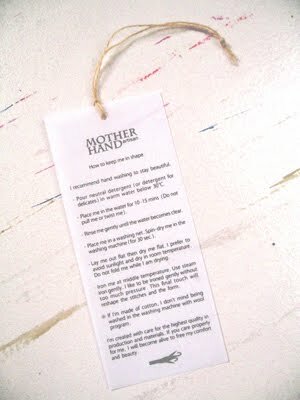 It is advice about how to wash for use your knit of MOTHER HAND artisan habitually for a longer time. You can see as follows so that knit talks. I recommend hand washing to stay beautiful. - Pour neutral detergent (or detergent for delicates) in warm water below 30℃. - Place me in the water for 10-15 mins (Do not pull me or twist me). - Rinse me gently until the water becomes clear. - Lay me out flat then dry me flat. I prefer to avoid sunlight and dry in room temperature. Do not fold me while I am drying. - Iron me at moderate temperature. Use steam iron gently. - If I'm made of cotton, I don't mind being washed in the washing machine with wool program. I'm created with care for the highest quality in production and materials. If you care properly for me, I will become alive to free my comfort and beauty. After rinsing, you can use a fabric softener that will be softer finish. Please use a fragrant softener which has the aroma of your favorite.